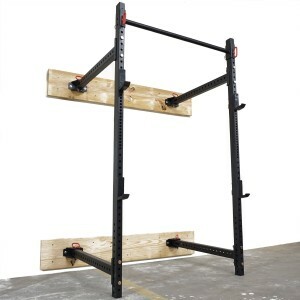 Titan Fitness RML-3W is an easy to set up, fold back design, wall mounted, very solid “built like a tank” made in USA power rack with 11 inch gauge tubing. It is 41 inches deep and 50 inches wide, is laser cut for precise fit and J-hooks are included in the pack. Once you get it out of the box you’ll find the necessary tools (hand wrenches are adequate, you won’t need an impact gun but would definitely make it easier) and clear instructions with the useful measurements that make this quite easy to install with all parts fitting well and will be easier if you have another person to help you too. Wood stringers are not included in the package and if your floor is not even you can put a shim underneath the legs and once completed it feels rock solid as mounted on the wall and you can start doing your different exercises including dips, squats, bench press and more so you don’t have drive to the gym to share the weights (gives you a feeling of having a home gym without having to own other fitness equipment) with other people and will certainly not move or shake when you’re doing pull ups as you may think this being a foldable design power rack- is a proper heavy duty unit. Titan Fitness RML-3W has a powder coated durable finish which will make it last longer (will not wear easily with use), can carry a maximum of up to 1000 pounds of weight which makes it suitable for both home and professional use by many people every day- it weighs 175 pounds in total and measures 41.5 x 50 x 91 inches, doesn’t take up a lot of space if you don’t have much of it in your flat and the plastic caps underneath to protect your floors. With the unique pin and hinge design that you can view on photos, you may quickly take out the pull up bar at the top and put aside (to its spot on the left) and fold the unit up so that it sits flush against the wall in a way it will take up very little space- only 5 inches from the wall (the 21.5 inch model that will be available at the beginning of 2016 on Amazon.com folds into the middle). We’ve had a look through many customer reviews on different websites and reviews are mostly very positive and this seems to be a workout unit that is well deserving its price tag. 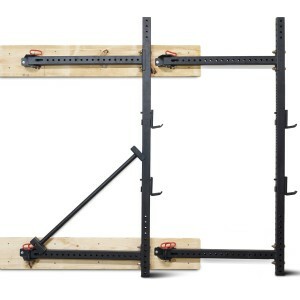 This is very solid and durable with a great build quality, functional, easy to set up and use, has a foldable design and is really great for the lower price level- you can certainly find better power racks but they will cost hundreds of dollars more.